**NOTE** - Bones are sold in bulk as single units and will be sent in a clear plastic bag rather than packaging shown in the images, as Ami is no longer selling them in pre-packaged form. The small bones are not sold in groups of three as with the older packaged version, each one is sold individually. These bone-shaped 100% vegan chew treats will be a dog’s favorite treat, and they have added benefits, too! The Bone Care chews have an exceptional balance of vitamins and minerals to help aid in proper bone support for your pampered pooch. 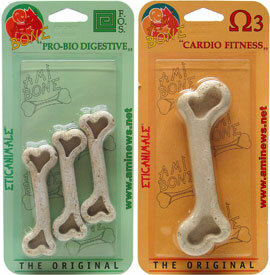 All varieties of Ami Bones are available in two sizes - small 25g bones are $.99 each, and large 75g bones are $2.49 each. Imported from Italy. From Simonetta Calabrese of Barton, Vermont on 10/5/2017 . on the plus side, my dog seemed to really enjoy it! on the downside, it was gone within six minutes. :( so, it's no good if you want it to last for a strong chewer. the benevo treats on here seemed to last longer than this. but i can imagine that it would do well for picky dogs and it would last a while, with a different dog. my dog is a food hound so all food is pretty much gone within two minutes of meeting his mouth. I always wanted a vegan "bone" for my dogs, and they all LOVE these!!!! And you can't beat the price either! I have four beagles, and it takes them awhile to get through them...I usually have to save part of the larger size for another day. Can't wait to have more of them in stock! From Richard Rankin of La Plata, Missouri on 5/23/2011 . I tried these because I had read reviews that these were 'the thing' for vegan wannabe strong shewing dogs. My dog liked it - for the under 2 minutes it took to eat it. If these are the vegan solution to strong chewers, it is a total failure. From Bethany of Newnan, Georgia on 3/31/2011 . Our pomeranian loves these. I try to get a few whenever I order some groceries from VeganEssentials. When she sees me get one from the bag she gets so excited. Sometimes she scarfs it down and other times she saves it for later, but she's always happy to get one of these bones! From Beth Sopko of New York, New York on 6/30/2010 . As soon as I opened my Vegan Essentials package today, I gave one of these to Corky and he grabbed it and took it away to chew on. He loves them, and I'm so happy to have a vegan chew to give him. The companion-animal market is far too flooded with meat-based food and treats, and I personally think at least some people are receptive to giving their animals plant-based food and treats.